As stated in my end of the year tidings post, I’ve decided to start doing a book a month in the new year that I will share with you on the first, and around the end of the month we will discuss! Since this is the first of January 2016 let’s begin! 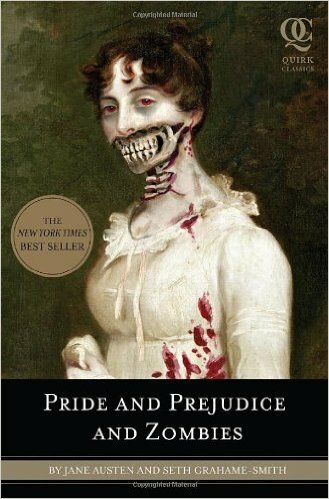 It’s no secret that I love Pride and Prejudice, and this novel is a retelling of a classic. This novel is written by Seth Grahame-Smith, who also wrote Abraham Lincoln: Vampire Hunter. Pride and Prejudice and Zombies, like Abraham Lincoln: Vampire Hunter, has been made into a movie, which I am quite looking forward to seeing. It comes out on February 5th, and you can learn more about the movie here. As always I would prefer to read the book first before seeing the movie or television show, though that doesn’t always end up being the case (see Austenland) I definitely intend to with this book. P.S. The Abraham Lincoln: Vampire Hunter movie is phenomenal. Watch it!